It’s time to raise a glass- or a large mug of black coffee in my case. The third book in The Folville Chronicles launches today! 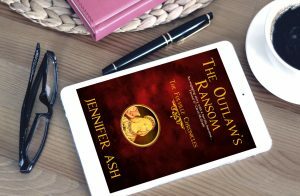 Edward’s Outlaw follows hot on the heels of The Outlaw’s Ransom and The Winter Outlaw. Available in both ebook and paperback formats, you can buy your copy today! January 1330: King Edward III’s England is awash with the corruption and criminal activity that his mother, Queen Isabella had turned a blind eye to- providing it was to her advantage. Now, having claimed the Crown for his own, Edward is determined to clean up England. 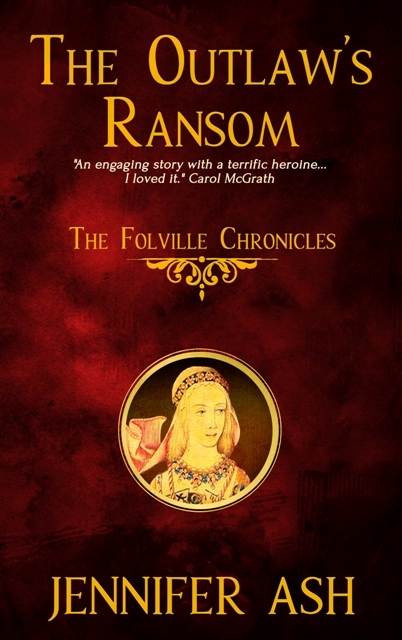 Encouraged by his new wife, Philippa of Hainault and her special advisor- a man who knows the noble felons of the countries Midland region very well- King Edward sends a messenger to Roger Wennesley of Melton Mowbray in Leicestershire with orders to work with the county sheriff to arrest five of the Folville brothers…including the newly married Robert de Folville. 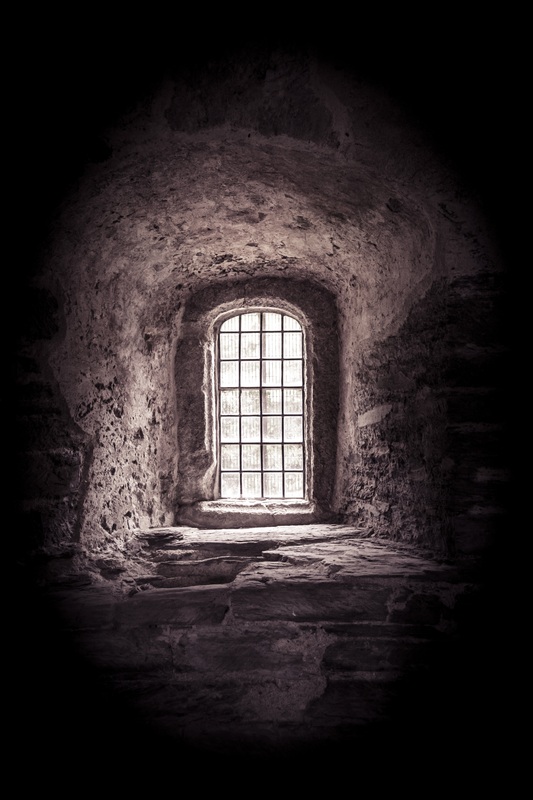 Robert takes his wife, Mathilda, to Rockingham Castle for her own safety, but no sooner has he left, when a maid is found murdered in the castle’s beautiful guest suite, the Fire Room. The dead girl looks a lot like Mathilda. 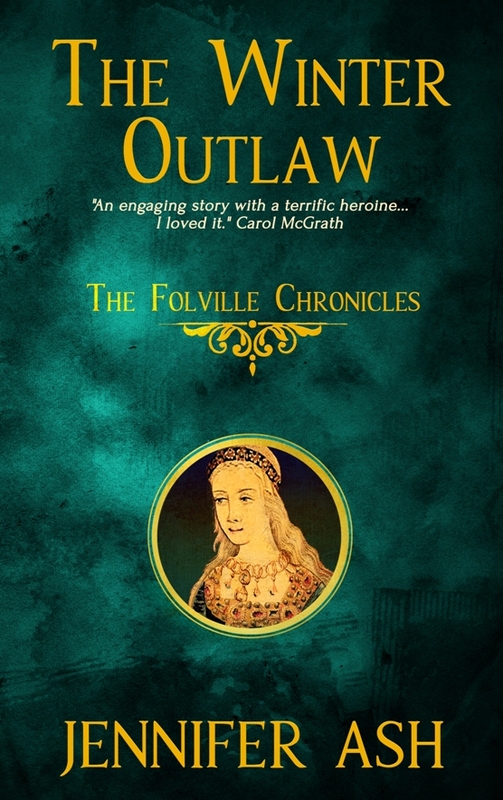 Was she the target, or is Mathilda de Folville’s life in danger? 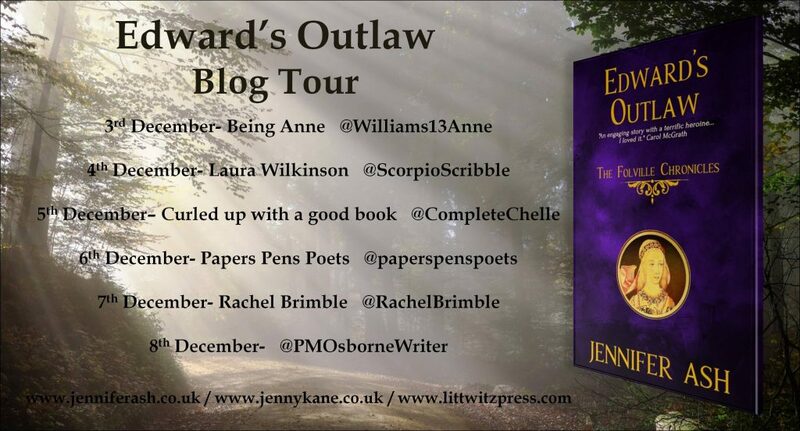 You can find out lots of information about Edwards’ Outlaw, from how it was written to what inspired it, and read an extract or two, by following the launch blog tour which begins today! Let’s take a peep inside The Folville Chronicles – Book Two: The Winter Outlaw . Adam Calvin’s vision blurred as his eyes streamed in the cold. His breath came in wheezing puffs. He needed to rest, but he daren’t. Not yet. It was only as the vague outline of a cluster of homes and workshops came into view in the distance that he realised where his legs had been taking him. Slowing his pace, but not stopping, Adam risked a glance over his shoulder. He’d expected to see dogs, horses and men chasing him, but there was nothing. No one. Scanning the scene ahead, making sure he wasn’t running into trouble as well as away from it, Adam exhaled heavily and aimed for a building he hoped was still standing. The last time he’d visited the tiny village of Walesby there had been an old grain store on its outskirts. Built too close to the point where the frequently flooding Rivers Maun and Meden merged, the grain store had paid the price of a poor location. Long since abandoned in favour of a superior bake house, it was a perfect temporary hiding place for a man on the run. Adam had no breath left with which to sigh for relief when he saw the neglected grain store. Uttering a prayer of thanks to Our Lady for the fact the building hadn’t been pulled down, he lifted the worn latch. He eased his way into the damp space, which was stuffed with rotting sacks containing all manner of rubbish. Scrabbling awkwardly over the first few rows of musty sacks, Adam made himself a man-sized gap at the back of the room. Sinking down as far as he could, hoping both the sacks and the dark would shield him long enough for his cramped limbs to rest, he did his best to ignore the putrid stench and allowed his mind to catch up on events. Only a few hours ago everything in Adam’s life had been as it should be. He’d been fast asleep in his cot in the small private room his status as steward to Lord John de Markham gave him. Adam wasn’t sure what time it had been when he’d been shaken to his senses from sleep by Ulric, the kitchen boy. He suspected it hadn’t been much more than an hour after he’d bedded down for the night. Ulric, who’d frantically reported that a hue and cry had been called to capture Adam, had urged his master to move quickly. The sheriff had unexpectedly arrived and there had been a brief meeting between him, the Lord Markham and one other unknown man. An anxious Ulric had said that rumours were flying around like snowflakes in the wind. Some of the household staff were saying Adam had stolen something, some that there had been a death; a murder. Either way, for his own safety, Steward Calvin had to leave. Fast. Confused, scared and angry that his good name was being questioned; without having time to find out what was going on or defend himself, Adam had grabbed his scrip. Pulling on his boots and cloak, with Ulric’s help he’d headed through the manor via the servants’ walkways. The only item Adam hadn’t been able to find to take with him was his knife. Contenting himself with lifting one from Cook’s precious supplies as he ran through the kitchen, he’d left the manor that had been his home for the past twenty years. With a fleeting nod of gratitude to his young helper, Adam had fled into the frosty night. Only minutes later he’d heard the calls of the hue and cry; echoes of the posse’s footfalls thudding against the hard, icy earth. Now, wiping tears of exhaustion away with the back of his hand, Adam strained his ears through the winter air. All he could hear was the busy work of the mice or rats who were taking as much advantage of the building as he was. Glad of the water pouch Ulric had stuffed in his scrip, Adam took a tiny sip. He didn’t know how long it would have to last him. Closing his eyes, he rested his head against the sacks that boxed him in and tried to think. Had he outstripped the hue and cry? If they were nearby, taking the chance to rest while waiting for him to run again, then Adam was sure he’d have heard something ‑ but there were no muttered voices, no horses panting and no hounds barking at his scent. Adam managed to get his breathing under control. He’d been part of the hue and cry on occasions himself, and he knew such groups didn’t tend to chase their quarry far, or for long. Especially not on a cold winter’s night, when they could be tucked up in bed before the demands of the next working day. With growing confidence that he’d chosen his bolthole well, Adam allowed himself to relax a fraction. Few people lived in Walesby since the most recent of many destructive floods, and its location meant he was only a few steps from the edge of Sherwood Forest. A desperate man could easily disappear into the woodland’s depths. As the hours ticked on, Adam became convinced that the pursuit had stopped. However, he knew that by the morning the hue and cry would be replaced with soldiers if the sheriff barked the order. His bolthole wouldn’t stay safe for long. Yet that wasn’t what concerned Adam the most. He wanted to know what he was supposed to have done that warranted his midnight flight. How could he even begin to go about clearing his name if he didn’t know what he was accused of? In the meantime, where was he going to go? Ever since I did my PhD (on medieval crime and its portrayal in the ballad literature of the fourteenth century), I have wanted to use what I learnt to tell a series of stories. Although I’ve written all sorts of things between 1999, when my PhD finished, and now – I still wasn’t sure it would ever happen. Yet, here I am! The first three novels – one short – two long – are out in the world – and book four is in the planning stages! 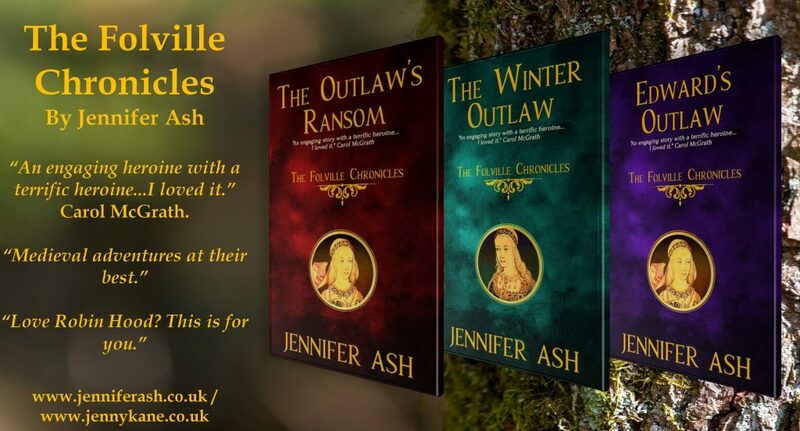 If you enjoy Mathilda’s first adventure, then you can rad more in The Winter Outlaw (The Folville Chronicles- Book 2), and Edward’s Outlaw (The Folville Chronicles- Book 3), which will be out on 3rd December. What a year it’s been for my ‘Jennifer Ash’ side! Not only have I had the pleasure (the privilege), of writing a number of audio scripts for ITV’s Robin of Sherwood, I’ve also been very busy with the continuing adventures of Mathilda of Twyford. 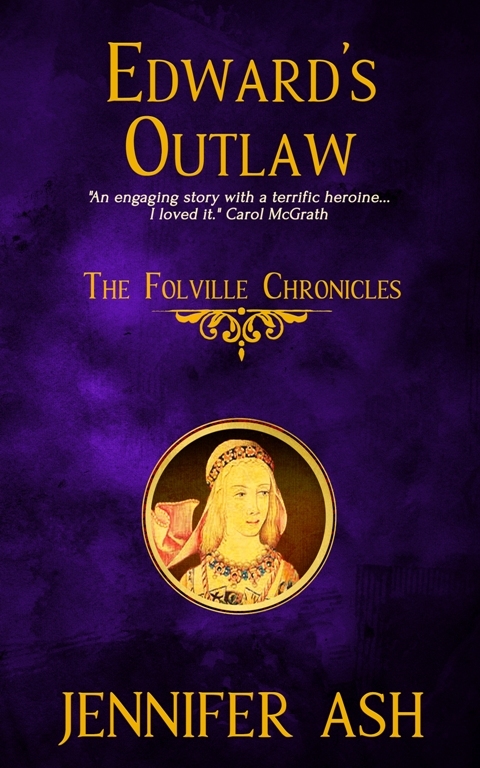 Mathilda’s earliest adventure, which features in the first book of The Folville Chronicles – The Outlaw’s Ransom – was re-released by Littwitz Press. The second book in the series, The Winter Outlaw came out in March. Now, after eight months intense writing, I can announce the forthcoming arrival of the third of The Folville Chronicles: Edward’s Outlaw. Edward’s Outlaw will be released on 3rd December. Come back for more novel release news soon. 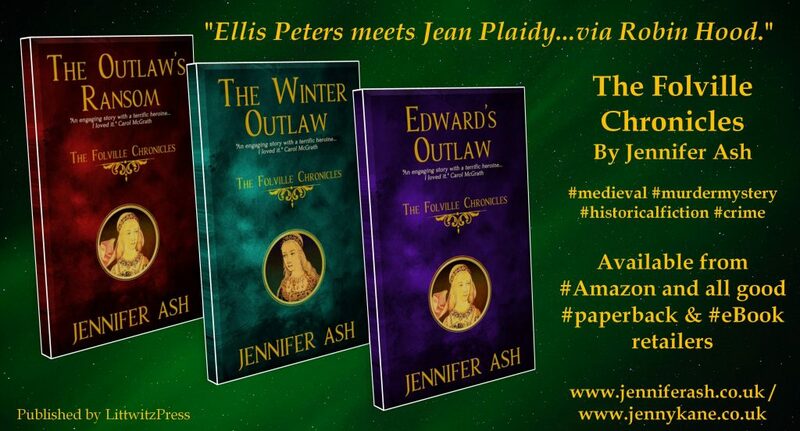 If you enjoy Mathilda’s first adventure, then you can rad more in The Winter Outlaw (The Folville Chronicles- Book 2), and Edward’s Outlaw (The Folville Chronicles- Book 3), which will be out later this year.